Alaska’s newest meeting facility, The Cordova Center, overlooks Cordova’s historic harbor with scenic vistas of our commercial fishing fleet, Orca Inlet and Hawkins Island. The Cordova Center is ADA compliant and offers a gracious layout with versatile amenities and breathtaking views of Cordova’s commercial fishing fleet, Orca Inlet and Hawkins Island. Without even leaving the building, your attendees can take advantage of our 200 seat theatre, historical museum and modern community library. Within the center, all meeting rooms feature state of the art lighting, temperature control and sound for professional presentations. A two-story glass enclosed atrium offers a compelling on-site registration area to kick things off, or a spectacular art-filled banquet area that can accommodate 200. The center’s versatile array of meeting spaces are custom designed to accommodate all your needs from those 200 seat general assemblies to those small break-out sessions for twelve. Additionally, the neighboring historic Pioneer Igloo and Masonic Lodge can serve as break-out meeting spaces, or fun historical settings for evening functions. Catering services offered by local vendors can provide everything from simple coffee service to banquets featuring local seafood and traditional fare. 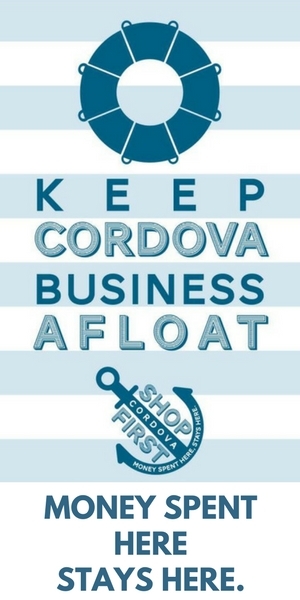 The Chamber of Commerce and your Cordova Center liaison are there to work with you as a partner step by step from planning to essential troubleshooting along the way to successful completion of your meeting or event.